Exfoliating is surely one of the top beauty “secrets”. It’s not just for your face; you can exfoliate your entire body as well at least once a week. Exfoliating on a regular basis will help you remove dead skin cells and allow new skin cells to turnover, making your skin look rejuvenated and more radiant. All these years we’ve been chugging coffee —without even appreciating that using a coffee scrub for body could slough away dry, dead skin to reveal a real glow. Considering the beauty benefits of coffee—like antioxidants and exfoliation—it only makes sense to use it in our regular skin care routines. 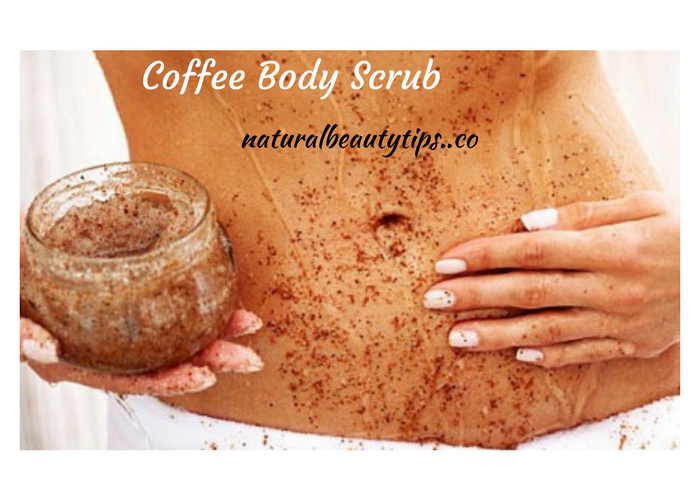 Why Body Scrub With Coffee? (i) Ground coffee bean releases slight amount of caffeine, which gets absorbed into your skin and can help increase circulation. Caffeine is water soluble so it gets mixed with water in shower and causes caffeine to go into your skin, which may helps increase blood circulation through your skin cells. (ii) Crushed coffee beans act as natural exfoliating agent. (iii) It smells damn good, which some times you need to liven you up in mornings. Read on to learn how to make coffee body scrubs at home. Most of the ingredients for these recipes are generally available in your kitchen. So what are you waiting for? Go to your kitchen and try our great recipes! This diy full body coffee scrub requires 4 natural ingredients and will transform your skin to look healthier just after a couple of uses. The caffeine in coffee helps to wipe away undesirable oils, leaving your skin flawless. The rough texture of the coffee grounds will slough off dead skin cells, making your skin feel amazingly smooth. (i) Combine all the 4 ingredients together in a glass bowl, and stir until thoroughly mixed. (ii) If your coconut oil is solid, gently warm it until it melts, but wait for it to get back to room temperature before combining with the other ingredients. This will ensure that your exfoliants don’t dissolve in the oil and lose their exfoliating properties. (iii) Once mixed, store your scrub in an airtight jar. Whenever you want, use on your entire body for great exfoliation. This diy body scrub recipe needs only 3 natural ingredients. Whereas it’s hard to completely get rid of cellulite, this method works on the whole reasonably well. While properties in coffee have been shown to help lessen the look of cellulite, the added benefit of coconut oil in the scrub will maintain your skin moisturized and amazingly smooth. (i) Mix well all the ingredients together. (ii) After you’ve washed your hair and body, massage the scrub while your skin is still wet. Scrub all over your body for about 60 seconds each per area, where you are targeting cellulite. When done rinse with warm water. You will feel your skin getting smooth, soft and hydrated. If you long for getting back into your swimsuit, here is an ideal DIY citrus coffee body scrub to make your body skin look smooth and radiant. (ii) Coconut oil: organic, without additives, melted. Mix all the ingredients in a glass bowl until everything is well combined. How To Use The Above Scrubs? (i) Take the body scrub in your palm. Begin from the lower end of your body (towards your feet) and work your way up exfoliating in circular motions until you’ve reached your neck. (ii) If you want, you can use any of the above scrubs on your face unless your skin is sensitive to any of the ingredients. Let the scrub sit for 10 minutes or longer and then rinse. (iii) Do it once a week regularly. You will find your skin is improving in softness and may even see the scars getting diminished, if you have any. (iv) Store the leftover in an airtight container. Note: Body scrubs made using coffee cab really be messy in shower, as the coffee ground will go everywhere! So don’t be surprised and be prepared for that. Have a beautiful and glowing day! Let us know how your skin feels after using the above scrubs under the comments section? The coffee body scrub sounds lovely! My skin tone is oily. Is it Applicable for oily skin also.